Hundreds of mind-body experiements have been conducted–including placebo studies and research on the power of meditation and prayer–but few scientists have attempted to explain the underlying biology of belief. Notice the huge logical gap here? The intro about the miraculously cured cancer guy was talking about the biological effects of belief. 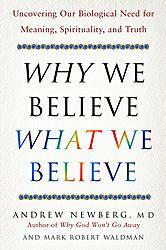 Now suddenly we shift gears and are talking about the biological underpinnings of belief. The two certainly could be related and may form some kind of feedback loop, but certainly it’s not correct to completely conflate them. This type of confusion continues throughout the first chapter and the entire book. It’s almost as if Newberg dictated the book and never bothered to proof it. We’re told, for instance, that the book will propose a “practical model of how the brain works that will help you understand your own beliefs and the nature of reality”. Understanding my own beliefs sounds good, but also understanding the nature of reality? This is just muddle, with no idea where the boundaries between “you”, “brain”, “belief”, and “reality” might lie. If we understand the neuropsychology of the brain [sic], our beliefs will be able to grow and change as we interact with others who have different views of the world. It is my hope that as we become better believers, we will exercise greater compassion in our search for meaning and truth. This is gobbledygook pure and simple. Our beliefs grow and change completely independent of any meta-level “understanding” we may have of neuropsychology or anything else. The concept of “better believers” is puzzling in the extreme–is Newberg trying to say that someone with an intellectual understanding of the phenomenon of belief, not that we’re going to get it from this book, is a “better believer”? Neurologically, such prejudice seems rooted in human nature, for the human brain has a propensity to reject any belief that is not in accord with one’s own view. Next we jump to the interesting but completely peripheral issue of whether animals can have beliefs. What quickly becomes apparent is that Newberg has completely neglected to do the simplest categorization of types of belief. There’s Mr. Wright believing the cancer drug would work; there’s people believing in God, or political parties; and now we’ve got animals who supposedly have beliefs in the sense that they have an “ability to form new assumptions about their environment”, like dogs who “believe” their master will return. Geez, even amoebas have “beliefs” formed when they’re shocked. This is madness. My cat believes that when he ascends the stairway he’ll be on the second floor, or that in the morning Daddy will come down and pet him. For that matter, I “believe” that when I type a key on the keyboard the corresponding letter will appear in this blog entry. Whether or how those “beliefs” have anything in common with a belief in the Virgin Mary is the real point and the one that Newberg studiously avoids. But wait, there’s more. Maybe inaminate matter–such as rocks–have beliefs! Because if their “smallest subatomic particles could have some form of self-volition or consciousness” then that would be sort of like a kind of belief! And if they did then all things in the universe would be connected in a great circle of consciousness! Just like the Native Americans believe! And the best thing is that believing in belief, believing that there’s all those beliefs out there, can bring us a sense of peace and equanimity! Newberg cannot end the chapter without one final, confused segue, this time to beliefs as really cool things, with all kinds of benefits, that we should have more of, attributing to them tautological miracles such as “giving us our sense of ourselves” (we have beliefs, and we believe we have those beliefs, and we believe that we are the person who has the beliefs we believe we have, maybe?) and “helping us regulate the emotional centers of the brain”. Mine aren’t too regulated, and that’s due, I now believe, to me just not having enough beliefs! This entry was posted on Tuesday, May 6th, 2008 at 11:23	and is filed under neurotheology. You can follow any responses to this entry through the RSS 2.0 feed. You can skip to the end and leave a response. Pinging is currently not allowed.